Looking for a subtle and stylish way to create more shade in your home, but tired of those standard curtains that get dirty so easily? Looking for a unique way to design your room and add that last touch that it desperately needs? Don’t look any further – get bamboo curtains! Bamboo curtains are a great addition to any home, because they add both a little bit of class and a sense of coziness. There is a big variety of bamboo curtains nowadays – such as bamboo curtains for windows, doorways, balconies… Moreover, they come in many different shapes, sizes, and colors. Bamboo curtains are especially produced and used in countries like India (Hyderabad, Chanai, Cochin, Pune, and Trivandrum are famous for them), Singapore, and Japan. However, many other countries are following the bamboo trend. Overview of different styles of bamboo curtains. There are different species of bamboo plants, but most of them have green or brown stalks. Most bamboo curtains are made of natural bamboo stalks. Bamboo curtains come in many forms, colors, and sizes. 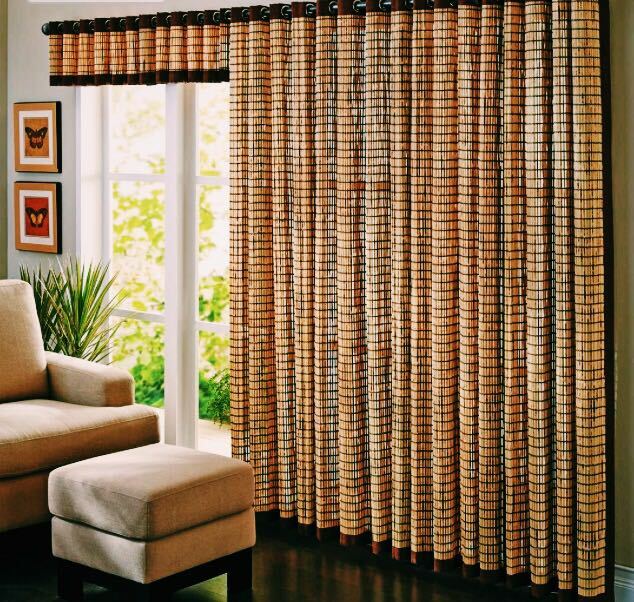 Bamboo panel and roll up curtains are the most common types, but bamboo beads used as curtains are popular as well. Some of them are specifically designed for the outdoors. Bamboo panel curtains - These are bamboo curtains in their simplest form. They usually have vertically-shaped reed, and require special rods and rings (and, in some cases, valances to cover up the curtain fittings). Roll-up bamboo curtains - The term says it already: curtains that can be rolled up. Roll-up bamboo curtains come with an adjustable cord, although there are cordless roll-ups as well. Most sellers typically include all the hardware that is needed. In most cases, the tier of wooden sticks is placed horizontally. If a roll-up curtain is what you are looking for, make sure to get a size that is slightly bigger than the door or window opening. Bamboo beaded curtains – This type of curtain is used often for doorways in order to prevent flies and other insects from coming in. However, it also brings a little bit of that Hawaiian atmosphere to your home. A lot of people like the sound the beaded curtains make when there is a little bit of wind – as if you are in a tropical forest! Bamboo curtains for sliding doorways – Finding the right type of curtains for those who have sliding doorways can be difficult. Luckily, most companies that offer bamboo curtains offer bamboo curtains specially designed for sliding doorways. The draped and roll-up curtain styles are often used for sliding (glass) doors. Bamboo shower curtains – Most stores sell fabric shower curtains that look just like bamboo. Some of them have printed (pictures of) decorative bamboo plants instead. Versailles patented ring top bamboo panels – These are curtains that have a patented ring-top mounting system. Impressions of what bamboo curtains can do for your home! For every type of door and window, whether it is your patio door, balcony door, or kitchen window, there is a right fit for you. Do you have a gazebo? Consider getting hanging bamboo curtains. It instantly gives your gazebo an exotic, but elegant look at the same time! And, if you are the proud owner of an Asian restaurant: bamboo wood blinds give the place that oriental twist that it needs. Besides, bamboo curtains also can help in keeping insects or birds outside, while simultaneously allowing your guests to enter your premises easily! Common lengths of bamboo shades are 34 inches, 54 inches, and 72 inches, although you will usually be able to find the exact length you need online. As for the color – there is an endless quantity of colors available, although honey oak brown and paler shades of brown are more popular. Dark grey bamboo shades can be perfect for more modern interior designs (Pinterest is a great source to see some great examples of this). Do you prefer something more colorful? No problem – there are many painted bamboo blinds that can make any space look more playful. You can find a great collection of bamboo shades and additional products online. Pier 1, Target, Walmart, and the HomeDepot are all great sources to purchase any type of bamboo product that you are looking for. Amazon sells a great amount of bamboo curtains as well, and shows you a list of similar and related products (such as rods, rings, valances, and other bamboo shade hardware). Amazon – Amazon is probably your best online source for anything that is made of bamboo. Their bamboo curtains come in various shapes, sizes, and colors. You can also find very cheap options here, in case you are on a budget. Pier 1 – Pier 1 has very elegant looking, high-quality draped bamboo curtains in several different colors. Their prices range between $79,95 and $89,95. Target – Target has a small selection of bamboo curtains and valances, but has a very big collection of bamboo related items. Walmart – Online, Walmart offers a big selection of different bamboo curtains that come in many colors and prints. Like Amazon, they also offer Versailles patented bamboo curtains. 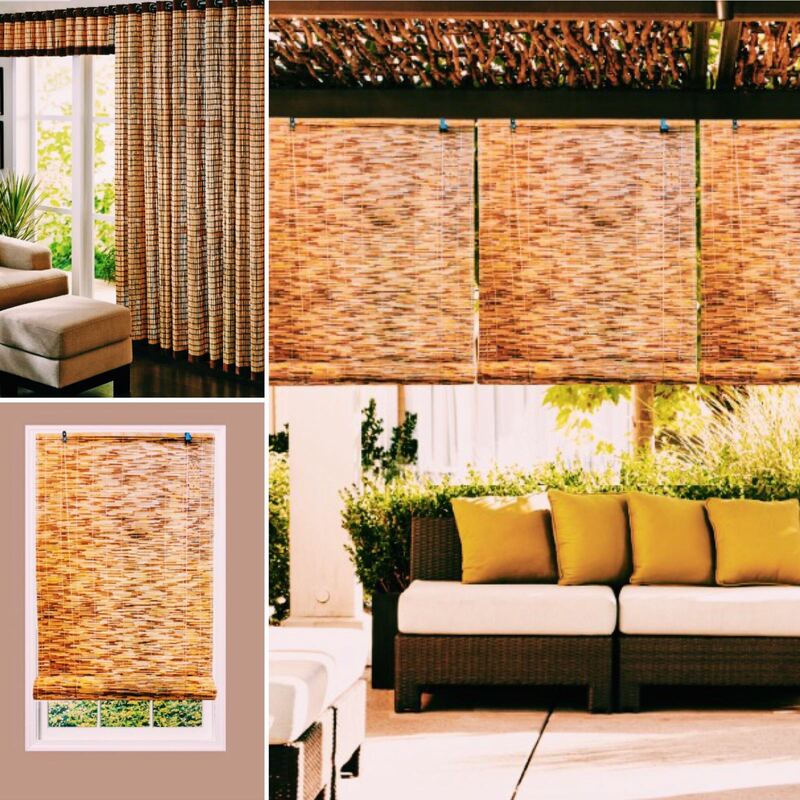 HomeDepot – For roll-up bamboo shades, the HomeDepot is your ultimate source. Their selection consists of mostly brown and beige-tinted roll-ups, some of them cordless. Their prices range between $10 and $150. Prefer to buy in-store instead? All of the stores named above are usually able to tell you whether the product of your choice is available in a store near you. 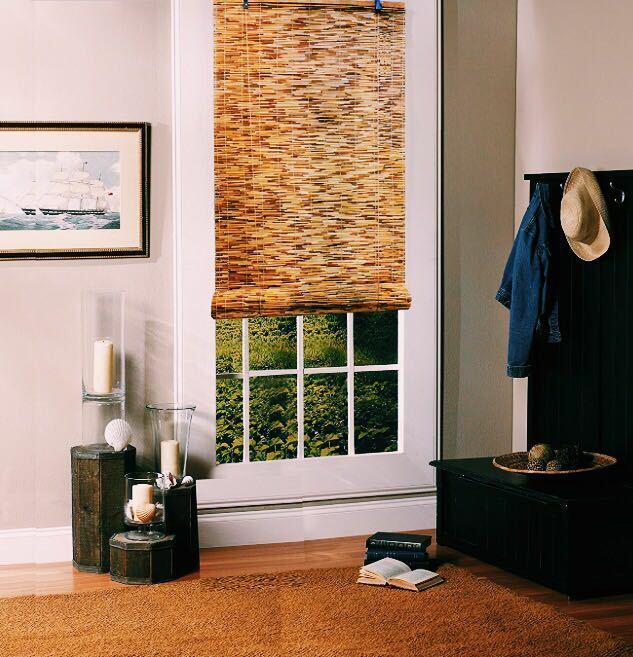 IKEA, Lowe’s, and JC Penney might also have the bamboo blinds that you are looking for, and their in-store assistants can answer any questions that you might have immediately. Do you live in Canada? No problem! JYSK Canada has a great collection available, and at Amazon Canada you can purchase bamboo window blinds with beautiful oriental prints. If you live in the UK instead – Amazon.co.uk and IKEA are your ultimate sources to find the best bamboo blinds. The price range of bamboo curtains varies between 15 and 150 dollars. There are many small bamboo curtains for windows available for less than 25 dollars, while most beaded door curtains are available for less than 50 dollars. Obviously, smaller curtains are cheaper, while the bigger ones are often custom-made and, therefore, more expensive. For the cheapest ones, you’re best off conducting a thorough search on Amazon. Here you can also find a lot of useful customer reviews to guide you through the process. Remember that more expensive is not always better – there are many cheap options that are just as good as any other. Most stores provide all the additional products needed, but always check if you are getting a full product or if you will need to buy some items separately. Bamboo shade liner – A liner that can be attached to the other side of your bamboo shades to darken a room, or to add privacy. They usually come with the product itself – they are not often sold as a stand-alone product. Most of them have an off-white color. Grommets – A particular type of ring that can be found at the top of many regular (draped) bamboo curtains. They are attached directly to the curtain. Rings – In contrast to grommets, rings are used for the loops that are attached to the curtains. They are not attached directly to the curtain. Rings can also be made of bamboo. Rods – A bar that is inserted through the rings or grommets to hang a (bamboo) curtain up. Valances – A piece of decorative curtain that is used to cover up the curtain fittings. There are special ones for bamboo curtains as well. Bamboo mats – Bamboo mats are very versatile. They come in many different sizes, and have many different purposes. Small, thin bamboo mats are used to roll up sushi, for example, or they are used as place mats or coasters. Thicker ones are used as floor mats or screens, or they are attached directly to the walls as decoration. Bamboo lampshades – Bamboo lampshades are beautiful lampshades that (once turned on) cast a soft light over the room. Bamboo floor lamps are a very modern and luxurious addition to your home. Bamboo shade house – When people talk about bamboo shade houses, they usually refer to greenhouses made of bamboo. Bamboo is an excellent choice for greenhouses, because it keeps crops out of direct sunlight, but leaves in just enough sunrays to stimulate crop growth. Bamboo furniture – Many bloggers have already picked up on the trend of the hanging chair made of bamboo. A very comfortable chair to relax in after a long day at work! And how about bed stands, stools, or bedframes made of bamboo? There are an infinite number of options. Bamboo flooring – The HomeDepot offers natural bamboo floors that have an aluminum oxide finish to protect your floor against scratches and tears. Amazon sells bamboo flooring as well. Last, but not least: a bamboo plant for the indoors or outdoors is a great eye-catcher that is easy to take care of. Keep in mind that some of them can grow very big. There are many websites available online that explain how to take good care of your bamboo plant.